[CONSTITUTION]. Newspaper. 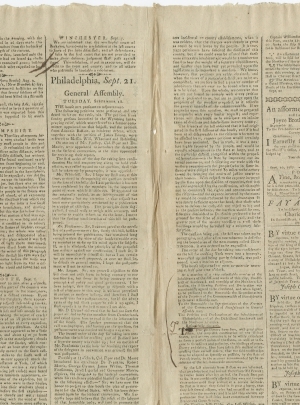 Pennsylvania Packet and General Advertiser, September 21, 1787. John Dunlap, Philadelphia, Pa., 4 pp., 12 x 18¾ in. 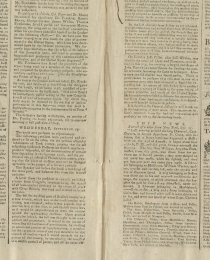 Reports on the proposal of the Constitution to Pennsylvania. “To the Honorable the Representatives of the Freemen of the Commonwealth of Pennsylvania…your petitioners have seen, with great pleasure, the proposed constitution of the United States, and as they conceive it to be wisely calculated to form a perfect union of the states, as well as to secure to themselves and posterity, the blessings of peace, liberty and safety, they have taken this method of expressing their earnest desires, that the said constitution may be adopted as speedily as possible, by the state of Pennsylvania.” (p. 3, col.1). 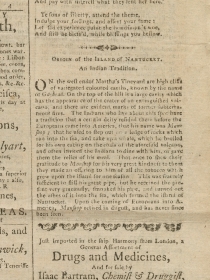 Contains a section entitled: “Origin of the Island of Nantucket. An Indian Tradition.” “On the west end of Martha’s Vineyard are high cliffs of variegated coloured earths, known by the name Gayhead….The Indians who live about this spot have a tradition that a certain deity resided there before the Europeans came into America.” (p. 3, col.4). Benjamin Franklin (1706-1790) Born in Boston, he originally worked as a printer for his older brother. 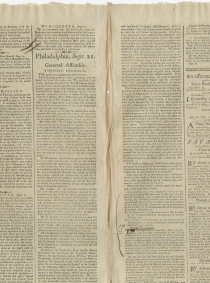 After moving to Philadelphia, he started his own newspaper, the Pennsylvania Gazette, in which he published his ideas in support of American independence. He was very involved in the writing of the Declaration of Independence, and during the Revolutionary War was appointed Ambassador to France, where he negotiated the important alliance between the two nations. Franklin was also known for his science experiments, most notably with regards to electricity.